F3: Festive Outfit & Win a Christmas Eve Dinner for 10 @15% OFF. 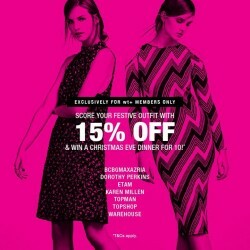 Enjoy and grab F3 15% OFF score your festive outfit and win a Christmas eve dinner for 10. Exclusive for members only Term and conditions apply. Don't undermine a quality outfit by shuffling into a pair of scruffy shoes this holidays. Receive a free pair of shoes with any suit set purchased from now till 22 Nov! Terms and conditions apply. Till 15 Nov 2015 F3: shopping marathon @SHOPATHON. Enjoy F3 shopping marathon A SHOPATHON. Sign up now as a wt+ member at our stores and enjoy these shopping perks More details here. Term and Conditions Apply. 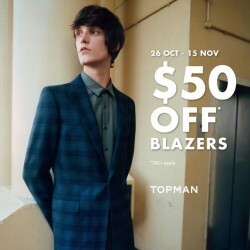 Till 15 Nov 2015 F3: Prom Night in Smarts and Suits with $50 OFF Blazers. Enjoy F3 this day you’re to remember for the rest of your life, so dress to impress on prom night in smarts and suits with $50 off blazers from now till 15 Nov. Term and conditions apply. Enjoy F3 Perfect for prom 40% OFF on 2nd pc on all Dresses. This promotion is valid till 8th November 2015. Terms and conditions apply. 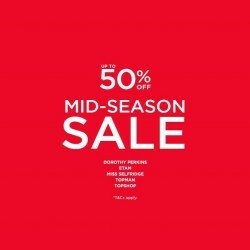 Enjoy up to 50% off Mid-Season sale at Dorthy Perkins, Etam, Miss Selfridge, Topman, Topshop. Terms and conditions apply. Grab for this amazing deals came from F3 offers their Golden Week Spree and save up to 15% OFF Total Bill. Term and Conditions Apply. Shop new season essentials at Etam and enjoy 15% off reg-priced items. Exclusively for DBS/POSB Cardmembers and wt+ members. Now till 27 Sep 2015. Pick out your favourite AW15 styles in stores now. Terms and conditions apply. Enjoy F3 offers you this Dorothy Perkins Style Heroes AW15 and enjoy Up to 20% OFF In store. so hurry Grab now today. 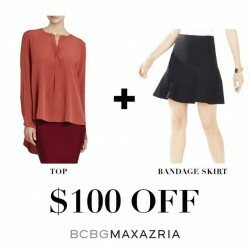 Enjoy F3 offers and grab this BCBGMaxazria top and bandage skirt for only $100 OFF. term and condition apply. Enjoy this 50 Years of the little red dot celebration and get up 50% Off on 2nd piece This promotion is valid till 10 August 2015. Term and condition apply. If you love fashion, you will love F3! The stores under F3 are having their End of Season Sale with final reductions up to 70% off from 16 July 2015 onwards! What’s more, you get to enjoy additional 15% off sale items (min. 2 pcs) from now till 19 July! Terms and conditions apply. Update your wardrobe now at Ben Sherman, Dorothy Perkins, Etam, Miss Selfridge, Topman and Topshop! Enjoy and get Two great deals await! 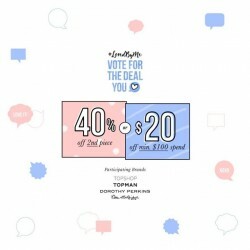 Vote for the deal you love to go on sale And get Up to 40% OFF 2nd piece or $20 off min. $100 spend(19 Jun)! Hurry grab yours Today! 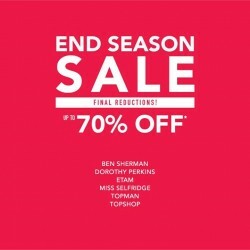 Ben Sherman, Topman,Dorothy Perkins, Miss Selfrigde, Topshop, Etam, sound familiar? That's right, they are all under the F3 group in Singapore. 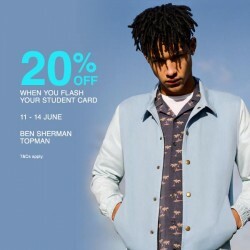 At this Great Singapore Sale season, F3 offers 20% OFF for students, all you need to do is to bring your student card and flash it at the cashier counter! The promotion is valid from 11 to 14 June 2015. So, come and hurry! 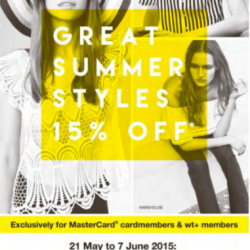 Great summer styles up to 15% off, exclusively for MasterCard® cardmembers and wt+ members @ F3. Bring your friends and family on F3 Singapore Sale and get an additional 30% off for UO Card (min. 2 pcs): Ben Sherman, Dorothy Perkins, Etam, Miss Selfridge, Topman and Topshop. Exclusively for UOB Credit/Debit Cardmembers and wt+ members. Get 15% OFF SS15 Hot Deal for Spring Summer Collection. Exclusively for MasterCard cardmembers and wt+ members until 19 April 2015. Enjoy 15% off Spring Summer Collection (min 2 pcs) at BCBGMAXAZRIA. Valid on regular-priced items only. Terms and conditions apply. Visit in-store for more details. Offer valid for MasterCard Cardmembers and wt+ Members only. 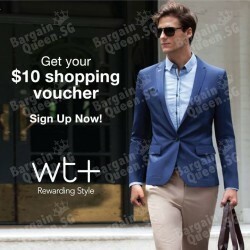 Get $10 Voucher from Selected Brands when you sign up as WingTai Retail Member. Don't miss this out! Holiday Lovin’! 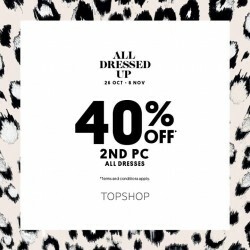 F3 Singapore offers 40% off 2nd pc on the following brands: Dorothy Perkins, Miss Selfridge, Topman and Topshop. Terms and conditions apply. Check in-store for more details. Students rejoice! Reward yourself this school holidays with 10% off on F3 Star brands when you flash your student card. Update your wardrobe with their latest new arrivals and you'll be set for Spring in no time! T&Cs apply. 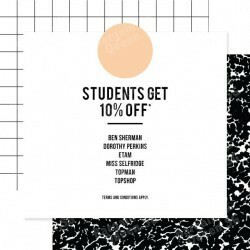 F3 Stores gives you 10% off Student Privilege on the following brands: Ben Sherman, Dorothy Perkins, Etam, Miss Selfrdge, Topman and Topshop. Hurry and don’t miss out! Terms and conditions apply. Selected F3 Stores brings you 20% off with min. 2 pcs Purchase on the following brands: BCBGMAXAZRIA, KAREN MILLEN & WAREHOUSE this 13-18 February 2015. Celebrate the Lunar New Year with brand new intimates! Take 40% off (min 3 pcs) and additional 15% off (min 3pcs) from 12 - 15 Feb! Located at Raffles City #02-08 and Wisma Atria #01-31/32. 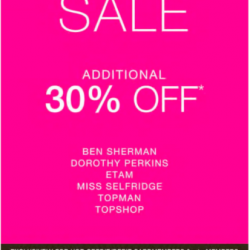 For ONE day ONLY, you get to enjoy $29 Hot Deals at Topshop, Topman, Miss Selfridge & Dorothy Perkins at F3 Stores!